Milk kefir is, to put it lightly, an acquired taste. Sour and pungent, milk kefir is a cultured dairy food originally from the Caucuses – the region where Europe meets Asia. There it has been traditionally heralded as an elixir of long life and health. It seems that there’s wisdom in this tradition: milk kefir is rich in beneficial bacteria, phosphorus, vitamin K, biotin and folic acid – nutrients that are essential to health and well-being. A single component of milk kefir – kefiran – may prove particularly beneficial as it successfully protects beneficial bacteria from damage in the hostile environment of the digestive tract1. Milk kefir is strongly anti-inflammatory2 and may prove helpful in combating gastrointestinal distress caused by infections from bacillus cereus3, salmonella, e coli and helictobacter pylori4. Milk kefir is also particularly important in recovering from clostridium difficile infection and associated gastrointestinal discomfort and diarrhea which often accompanies use of antibiotics5. Despite the fact that milk kefir is, itself, a symbiotic colony of bacteria and yeasts (or SCOBY), milk kefir also acts as a powerful antimicrobial food – helping to limit the growth of pathogens while encouraging the proliferation of beneficial bacteria in the intestinal tract. Milk kefir, like other cultured dairy foods, may also play a role in the prevention of cancer as it exhibits antitumoural effects6. Cultured dairy foods, including milk kefir, have been found to play a role in the prevention and treatment of bladder cancer7, breast cancer8 and colon cancer9. Indeed, some researchers have concluded that milk kefir may be one of the most promising foods when it comes to cancer prevention10. Milk kefir is cultured from a symbiotic colony of bacteria and yeasts (SCOBY) that is coloquially referred to as kefir grains. The appearance of these small colonies of bacteria and yeast vaguely resembles that of cottage cheese or even cauliflower. Milk kefir grains are white, lumpy and gelatinous and are comprised primarily of lactic acid producing bacteria including lactobacillus brevis, streptococcus thermophillus, lactobacillus casei, lactobacillus helveticus, lactobacillus delbrueckii as well as yeasts that include candida maris, candida inconspicua and saccharomyces cerevisiae11. Though, of course, strains of bacteria present may differ from one culture of grains to another. Obscure and exotic as it may seem, milk kefir is neither difficult to acquire nor difficult to prepare. As with many traditional foods, its beauty lies in its simplicity. It’s easy to begin preparing kefir and incorporating it into your family’s dietary rotation. 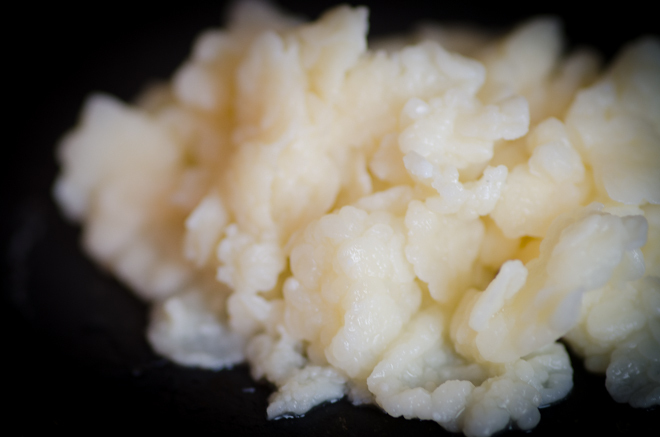 Once you’ve acquired a kefir grains, simply mix them in with milk – preferably raw – and allow it to culture at room temperature for 24 – 48 hours. As it cultures at room temperature, the beneficial strains of bacteria and benign natural yeasts will proliferate, metabolize the milk’s lactose and create a sour, thick beverage replete with vitamins, probiotics, kefiran and other nourishing components. The longer milk kefir cultures the more sour and folate-rich it becomes, but take care not to culture it too long lest it become unpalatable. If you know a friend locally who prepared milk kefir, you might ask for her excess grains. Alternatively, if you cannot find them locally, purchase them online. Milk kefir proliferates regularly and easily when cultured properly, so with time it will produce more grains than you can use. You can then give these away to friends, blend them into smoothies, or add them to the compost bucket. Preparing milk kefir at home is remarkably easy and quite affordable. It takes considerably less effort than homemade yogurt and homemade yogurt requires very little effort, indeed. Place milk kefir grains in the bottom of a clean mason jar. Cover with 1 quart fresh milk. Very loosely, place the lid and band on the mason jar. You do not want to tighten it because, as with all fermentation, carbon dioxide is created and needs to escape. Culture for 24 â€“ 48 hours at room temperature. For a for a thin, mild kefir you can culture for 12 hours. Once culturing is complete, strain milk kefir into a new mason jar, cap and refrigerate. Begin reculturing a new batch of kefir, if desired or allow your kefir grains to rest in water in the refrigerator for a few days until youâ€™re ready to make kefir again. I’ve been making kefir from a combination of coconut milk and cashew or almond milk (homemade), and you are right that it is an acquired taste! I usually hide it in salad dressings or smoothies. I feel amazing when I have it, so I’m trying to stick with it. During the summer we had kefir smoothies almost daily. With winter here we make less smoothies and more kefir cheese. Will you share a frozen yogurt recipe using kefir? I make this recipe with kefir and it’s super yummy! This is next on my list. I need to get some grains. I wish I could convert WKG to DKG as you can the other way round, as I have so many WKG. Is your ranch dressing posted or will you be posting it soon? I’d love to try it! Would you be willing to share some WKG for DKG? I’d love to swap with you! At any rate, I use this dressing: https://nourishedkitchen.com/fil-mjolk-ranch-dressing/.&nbsp; My recipe originally called for fil jmjolk which is quite nice, but I’ve used kefir with no problem at all. I would LOVE to, as long as you don’t mind tan crystals. I use demerara in my WK so the crystals have taken on that colour. They are reproducing like mad though (well, when they’re not in cold storage, as they are right now, LOL). Ironically, I was just viewing the swap board you have. I’ll have to add some offers, as I have several scoby’s & after I measure my grains, I’ll see what I have left. My email should be accessible through my comment, if not, LMK & I will contact you! Thank you for your kind offer, as well as the link! My kefir grains are tan, but do not multiply. I have been useing them 3 months with raw goat milk. Should they be multiplying by now? After three months, they should multiply, and they should be white or cream-colored, not tan. Milk Kefir does not have to be sour. The first time I had DKG I acquired about a cup and a half. I added them to a 1.5 liter of milk and boy was extremely awful tasting and very sour. I let them die not knowing why I had such a horrible tasting kefir. When I let the milk ferment to long it does acquire that sour taste. My only problem now is that my grains are not growing. It seems that in the warmer weather they grow but in the cooler weather they disappear. Crazy. So I have had to keep my furnace up as I have many ferments on the go. But these bugs are worth it. If any ferments are having problems including yogurt, krauts, kvass or kefir – check to make sure they are at their optimal temperature. I LOVE my kefir! I’ve been making it for several months now. Just recently I’ve found a way to make my own fruit yogurt from it. So delicious! My last batch was blueberry and even better than the peach. I’d love to try some water kefir grains if anyone wants to trade for raw milk grains. We love kefir. My kids beg for it every morning…which gives me pleasure. Although I am buying it in a carton from the store…which is pricey. Making it is on my to-do list. We drink kefir almost every day, and I just recently started making my own, but I use a culture instead of the grains. Is there a difference? Hi, I tried to visit your blog, but there were no posts. Is it private? Thanks! Jenn, the powdered culture only contains a few select strains of bacteria and yeasts, and is not sustainable; you have to keep buying it. Kefir grains have something on the order of 50 different strains of bacteria and yeasts, and continually reproduce so once you get some you never have to purchase more. I have been trying unsuccessfully to make kefir in my kitchen for a few months. I’m wondering if my amount of milk was too small…1 cup. I didn’t want to waste my precious raw milk. I’m trying this recipe today and culturing for at least 24+ hours. Maybe my time was too short 12-18 hours. Hoping for success now. We’ve tried the kefir that you find in the grocery store. My kids (and my husband and I) all LOVE it! But, I suspect the storebought kind is not as healthy, hopefully homemade is just as tasty. Try, try again! My grains look healthy and are multiplying. At least I know they’re still alive. Thanks for your encouraging post. Oh! What is the wooden chop stick or small wooden whisk for? Are you supposed to stir them during the process? If you have never had homemade kefir before, it is MUCH different from store bought. As Jen said, an aquired taste for most people. Good luck! I’m not currently making kefir (hope to get back to it soon). When I have, I’ve usually added some cream. SUPER yummy! I noticed that the store bought kefir at the natural food stores here are LOW FAT. It’s interesting, but I can’t find a storebought kefir that is full-fat either. I wonder if Lifeway makes one? At any rate, home-brewed is supposed to be richer in nutrients and beneficial bacteria. Lifeway DOES make a full fat version but it is very hard to find. I found it at a health food store near my work but all other stores in my area only carry the fat free version. Hi, I’m hoping you can help me with my kefir. I recently rehydrated some DKG I got from Cultures for Health. Now I’m trying to make kefir with it. What exactly is it supposed to look/smell like when it is ready? Mine seems to go from really milky (maybe a little coagulation) to thick, almost solid (like really thick yogurt). Also, my grains don’t seem to be growing. Any thoughts as to why? I buy bottled kefir from the Amish co-op I belong to. We have deliveries every two weeks so I buy enough to last me until the next delivery. Will the cultures stay active this long? Has anyone tried to make kefir using store bought kefir? I can get high quality whole goat milk kefir in stores and want to try to culture some raw goat milk with it. I just did last night. I sterilized one of those glass jars that use a rubber sealing ring (minus ring) with hot water. I put about a pint of ordinary cold whole milk into it and pitched in a quarter cup of Lifeway plain lowfat kefir. I stirred it up, and left it with the lid ajar, and a clean muslin napkin over it to keep out dust. My house temp is about 80F during the summer, and when I checked it 18 hours later, it had turned thick, and tastes just like the Lifeway. One may not be able to do this indefinitely (that is, repeatedly use this newly created kefir as a starter), but it seemed to do fine as a one-off. Perhaps this would be a way to stretch your commercial kefir purchases. Kefir will not culture properly using a store-bought kefir as starter; however, you can culture it to some degree with powdered kefir starter culture though kefir grains are, by far, the optimal method. Jenny, I make kefir from fresh goats milk using plain cow’s milk kefir from the grocery or starter from my last batch. I’ve been heating the goat’s milk to180 degrees, cooling to lukewarm, adding starter and culturing for 24 hours or less. It’s wonderful – BUT now I’m wondering if I’m actually getting the best array of micro-organisms. I’m a blood type 0, intolerant to pasturized cow’s milk and still must limit my kefir intake or have congestion. So I’m ready to try the unheated milk with kefir grains. Two questions: Might my process be part of the lingering congestion problem? And, how fresh should the goats milk be, is milk a day or two old okay if refrigerated? Thanks so much for your work. Try not heating the milk so high of a temperature. I make kefir from raw milk & do not heat over 80 degrees. I do not want to pasteurize the milk. Bet that is the problem, you are using pasteurized milk & heating it too much, killing the beneficial bacterias. I bought the powder from the health food store – but I’m reading here they won’t keep growing? I should get good grains from someone then, right? Does it not have the same ‘goodness’ as regular kefir? I’m making my first batch out of raw milk, it has a nice sour-creamy scent right now (just started it this morning). I hope it tastes good, I’ve had kefir before and kinda like the sourness. Does any one have a good how to video for making raw milk kefir? This is a quick video on making raw milk kefir. It is really easy. Just strain the grains. You can actually do it just through your fingers if you don’t want to use a strainer. We usually have it with a touch of salt and cumin in the morning. I love the sour fizzy flavor! Thanks for this post, really well researched. We are on the GAPS diet and raw milk kefir has really helped to speed the healing process in our digestive tracts. Couldn’t have done it without kefir! I know your post is a bit old, but I am also very afraid of making a mistake with this fermentation stuff and becoming deathly ill. I have never gotten sick yet tho and have make milk kefir, water kefir, kombucha in mason jars. The jars weren’t ‘sterile’ per se, just clean. In fact, I just strain out the milk kefir grains and put them back in the same jar, refill it with more milk and carry on. The water kefir and kombucha batches were continuous brew. I wash & rinse with boiling water, invert on a paper towel. I don’t think you can botulism. Botulism needs an anaerobic environment (no oxygen) to develop, which can happen in canning and preserving, but not if what you are making is open to the air. Google around to confirm this, if you want. Not to say that other nasties aren’t maybe possible, but I don’t think botulism. Hey my name is Lesly i´m studying to became a journalist in Sweden and woundering if i can use the picture of the Kefir in a magazine? The magazine will only be published at our university in Stockholm. I have a question for seasoned kefir makers. I have been making kefir with grains from cultures for health for the past two months (about once a week.) I ferment the milk for about 36 hours each time. My problem is that the grains don’t seem to be multiplying. They stay the exact same. Any tips for me? Thanks! Hmn.. sounds like they may be starving. I was told they need fresh milk daily or every other day at the very least. I personally have been making 12-18 hour kefir.. a cup at a time and my grains were multiplying fine. We like to pour it over any kind of fruit or sip it out of a mug. I like to eat a handful of pecans with it. I think it helps me sleep better at night. I have a question. I would like to start making our morning smoothies with milk kiefer. I would like to make a quantity of smoothies to freeze ahead of time to make it easier on our health care aid who makes breakfast for mom. My question is does freezing inhibit the benifits of the cultures in the milk kiefer? Or should the smoothies be made fresh daily? Thanks for your blog, I have learned so much! Can you tell me what you know about the effect of freezing on the bacteria in milk kefir? I’d like to make some for my family and thought I would freeze the milk kefir in ice cube trays to be taken out and blended in smoothies. I love Kiefer! I am new into this world of probiotics and have lots of questions. We drink Lifeway, usually a flavored kind. My son (4) and myself have about 8oz a day. Is there an ideal amount to drink? This post says it’d made from yeast, I have issues with yeast & sugar, and wonder if keifer contributes? Also, are the benifits deminished because I’m drinking the fruit kind that’s low fat? Is the full fat version better b/c the bacteria have more to “eat” and therefore are healthier? Perhaps homemade should be on my list this year! I must say that I do feel better when I have it and I consider it part of our winter wellness routine! Read the ingredient label. Typically any commercial kefir product will be loaded with sugar as is yogurt. The exception would be “sugar-free” which would be plastered on the label. Making kefir is easy, reduces the price to the cost of milk and will give you definitely better quality kefir, and if you really like the sugar, I recommend KAL Stevia. It is outstanding. I chose it because I researched the one most preferred for taste and that was it. I concur. When using pure Stevia, I would recommend that you sweeten well before you intend to consume. The fine Stevia powder takes some time to integrate into whatever you’re sweetening. You’ll taste the Stevia immediately, but if you wait, it will taste better and be sweeter. Buy the larger container (approx $20+) because it reduces the price per serving to 1¢ or less and once you find out how terrific the Stevia is (NO negatives or drawbacks–it’s a plant and it’s actually good for you! ), you’ll be adding it to so many things! We typically discipline ourselves with sugar because of the drawbacks, but there simply are not any with Stevia (that anyone has discovered). I add only Stevia to kefir and I think I’m drinking a milkshake! Yet, with positive instead of negative results! I just got some kefir grains from a friend. My first batch did not turn out good. In 24 hours It totally separated from the whey and I had this huge ball on the top of the whey. Any ideas what I have done wrong? I used organic raw milk. This milk is the fattest I have ever had, it is almost like light cream. This is the season in New Zealand when the grass is very rich and growing like crazy. Can that be a problem? I think it may be because of keeping the kefir culturing for too long, especially if you leave it in a warm room. It happens to me sometimes: the kefir separates into clear whey on the bottom and a ball of white milk solids on the top. I just take out the grains, then mix the kefir with a wooden spon before drinking it. It is still ok and healthy to drink, and tastes the same. Mine often separate as well. I just stir it around until it is mixed well again. Theres nothing wrong with it.. Mine was thinner if I let it go so far as to separate, but its still fine. If you like it thicker, then dont let it go so long. Try to catch it when you first start to see any little pockets of whey at the bottom of the jar. That’s what happens to my yoghurt when I culture it too hot for too long. Maybe the same problem? Question: I brewed my first batch of kefir about a week ago, using organic raw milk and kefir starter from my local healthfood store – the culture is made by “Body Ecology” and seems to work differently than any instructions I’ve found online (including this one): the culture comes as a powder and does not need to be strained. The comapany says that the next batch can be made from a few tablespoons of the first. My first batch turned out great, but before I brew another, do you why there is such a discrepancy in the culture/brewing? You’ve got a culture powder.. not the grains that most folks are talking about here. our first attempt at keifer didn’t turn out thick, but as thin as the (raw) milk we started with, only sour. The instructions I used said to heat milk to 86 degrees, add culture, stir, then let sit at room temp. I guess my question is…………..WHAT is room temp? We keep our house pretty cool in the winter, around 65, so I wrapped it in a towel once warmed, and put it down in an empty stock pot to keep it warm for the 24 hours and it actually fell to 70 degrees . I’m wondering if it got too cool and this is why it didn’t ‘turn out’? It sounds like you’re using a prepackaged starter rather than true kefir grains which likely accounts for the difference in consistency / quality. Room temperature, as far as fermentation is concerned, is about 68 to 80 degrees F.
I love my kefir, I have some every morning – some morning its more tart than other mornings, but it did take some getting used to. I knew it was a good way to get the desired beneficial bacteria, but had no idea it was loaded with goodness. Thanks for the great information. How long will raw milk kefir last. I have still drunk it when it has been a couple of months old but now I have some that is more like 3-4 months old. I have used some of the whey off the top a few times but just keep forgeting about my kefir. Also, will my kefir grains that I have kept in water still be good? They have sat for at least a few months unused before. I use sheeps milk and buffalo milk, when I can get it, and the kefir seems to love it and grows really well duing those ferments. I left it in the UHT when I went away for 2 weeks and it is not looking well at the moment but I hope it will recover with a bit of care. What I would like to ask is has anybody used kefir for ice cream, and is it successful,and also is it still as healthy in a frozen state? If anybody has a good recipe you could share I would be grateful. I’m new to the whole kefir thing. Does it still work with pasteurized, homogenized milk? I know it’s not as healthy, but that’s the only kind of milk I typically find. If not, I usually drink coconut milk. Can kefir be made from that? Would I use water kefir or milk kefir grains? Hey, I got some grains from my cousin and forgot about them for a week. They have been in the kitchen in a plastic baggy the whole time. Are they still good? Hi I just bought raw milk and kefir grains from a local Amish store. The packet says to heat my milk to 85 degrees. Is that necessary? Actually it is powdered kefir not grains. Can yo olease identify that fiece of equipment tht looks kind of like a clay steamer and when I rolll over it the words “HTCRFsidebarad” pop up. I sit some kind of special equipemnt? Can you please identify that piece of equipment on the upper right that looks kind of like a clay steamer and when I roll my cursor over it the words “HTCRFsidebarad” pop up. Is it some kind of special equipemnt? Whrer is it availble from? Please put in a edit option for posts. In your instructions you say to let the kefir grains rest in the fridge in water. I thought that they needed milk to survive…needed the milk sugar to feed. Can you really rest them just in water. If so, for how long before they die? I was surprised to see the ‘rest them in water’ comment as well. I’ve been making Kefir for years and I only rest mine in milk. They will last easily two to three weeks in a cold refrigerator before you should think about changing their milk. And that milk, after two or three weeks, only needs to be changed because it has Kefired and the critters need to be fed. Hi! Do you have the research articles available that you referenced in this article. I would really enjoy seeing them. Thanks!! Is there a website where kefir grains can be purchased? Also, how can these kefir grains be reused to continually make new batches of kefir? I don’t want to have to buy new starter each time I want to make kefir. This article seems to have a lot of references, but I can’t find the sources cited at the bottom of the page. Could you share your sources? I’m always interested in reading new books or articles about kefir. Thanks! I see this question has been asked but I can’t seem to find the answer… Does freezing kefir harm the beneficial bacteria? If I were to make ‘kefir-pops’ for instance? Freezing will kill most of the bacteria. I have a couple of questions. What would be a practical and efficient way to strain the kefir after it is cultured? Am I not supposed to touch it with any kind of metal, such as a spoon or sieve? What about making kefir in a very hot Alabama summer climate? Can it go bad? I use a fairly large plastic strainer over a quart glass measuring cup. I pour it into the strainer & shake it back & forth while it`s nestled in the cup. It `s fast & easy ! I recently purchased a water kefir starter kit. Have you ever used it instead of the milk kefir? Can you flavor the Kefir with fruit? LIke strawberries, bananas, blueberries etc…? IF so when in the process can that happen? I was wondering….if I don’t have access to raw milk, would organic whole milk be sufficient? TIA! I try and do it the same time every day ( before bed) and that seems to work for me. The rinse water from the sieve, bowl, jar, spoon etc. all gets poured on the outdoor plants which thrive! I really want to start making this but I don’t drink dairy milk. So it’s okay if I make this with WKG and homemade almond milk? Will I be getting the same benefits? No. Almond milk will kill your WKG with time. It also won’t have the same benefits (i.e. kefirans). Does anyone know if milk kefir grains can be used in coconut milk safely for someone on a dairy free diet? I wanted to share some of my grains with a friend who’s son needs to be strictly dairy free. I have heard they can be used in alternative milks, but I didn’t know if the grains themselves would still contain milk. No, they can’t be used in alternative milks. They will culture alternative milks for a short period of time, and then they die off. He’d be better off drinking coconut milk cultured with a probiotic pill or a dairy-free yogurt starter. I make kefir, yogurt and other cultured foods regularly and I’ve found that adding a starter culture with more different bacteria strains can be an advantage of you’re treating a condition (like I do). The taste is similar a using grains, just a bit more tart and many more bacteria. I’ve tried many ways but Bodyecology Kefir starter culture is great, same with using Mercola Complete Probiotics; I just empty a few capsules in a bowl of raw milk and let it sit for 24 hours. Has anyone tried continuous brew milk kefir? In error while making my kefir I dipped a metal spoon lightly into the container with the milk that I needed to use to culture my grains . I am wondering if this will cause any problems with the finished product , or if this is capable of altering the potency or life of the grains . Thanks for sharing all the wonderful info on this site . No, it’s shouldn’t cause an issue. The idea that metal can never touch your milk kefir grains is a myth. To debunk the myth that your metal spoon or pot kills these wonderful bacterias: Stainless steel the most used metal in kitchens does not react with bacteria, they thrive on this surface without problem. Other metals do – copper, silver, iron, gold and copper alloys brass, bronze, … Take care and leverage goodness of these bacterias known since ancient times. I see reference numbers, but no references. Could you please supply them? Thank you! Thanks for this well researched article. I shared it with my readers. I’m making kefir over here in Northern Laos with the only milk I can get – UHT boxed milk. Not ideal, but my grains seem to be thriving, so I continue to make and drink it. Hoping I can get my own goat someday. I have the milk grains to make milk kefir. A local dairy makes fantastic milk kefir and also sells water kefir starter. I have been ordered off my feet for now due to an injury and I can’t make my normal yogurt. I have been making milk kefir with the local dairy’s milk by taking a quart of milk kefir, using 4 quart Ball jars, I fill the jars to the bottom of the Ball seal on the jars. Then I take their milk and fill the jars to the point I would if I were canning. I then put the tops on. I let sit out on the counter until they have thickened like the original milk kefir. This is normally about 8-12 hours depending on the temperature. I then put back in the refrigerator. This has worked fine for us with no trouble. Thank you so much for this article! I am just learning about traditional foods, and I am trying to introduce my family to them! My husband is lactose intolerant, but he can have homemade yogurt. I have started making kefir this last week, and have been using stevia to sweeten it. I am hoping to start my son drinking it as well as my husband. My husband also has severe eczema and I have heard that it helps combat that as well. How long eating cultured foods, does it take to have healthy gut flora? I’ve recently started making kefir. I’ve been just putting the whole jar of kefir, grains and all in the fridge until I’m ready to use it. Is there a problem with doing it this way? Or should I always strain them out and put them in water until I’m ready to use them again? too bad the kefir grains they’re selling is not gluten free. My son has celiac disease. Do you know another source for kefir grains that is manufactured in wheat free environment? Kefir grains are gluten free. Sorry ignorant here, are water kefir grains can be used for milk kefir? Are they the same thing? Can you use milk kefir in hot drinks such as tea? No, they’re not the same, and, no, you shouldn’t use them in hot drinks. Can I use store bought milk? Will I get the same benefits? What about non homogenized milk? I recently had topical candida on my arms and under myarmpits as well as half on breasts. With raw honey applied daily and cutting all sugar and flour out..it is miraculously gone! It was horrible. I am curious….since you mention that milk kefir has candida strains…do you know if it is contraindicated for topical candida? I have heard that at times during candida it is best to stay away from fermented foods for a while…and then you can start back up after candida is gone. Have any thoughts on taking milk kefir to keep the topical candida at bay?! Any has had a stomachache or upset tummy from drinking milk kefir? I’ve started to make kefir a month ago and I realized that my daughter and I get stomachache if we drink about half a cup to a cup. Is it because my kefir grain are out of balance? To me, they smell like cheesy more than sour. Can you use Raw Goats milk to make the Kefir? Do you have to activate or rehydrate the grains in pasteurized milk or can you just start them out in raw milk? If you’ve purchased dehydrated milk kefir grains, you should follow the package instructions to activate them, and then follow my instructions above moving forward. Can I start my grains out with raw milk? They suggest pasturized. You say to let your milk kefir grains rest a few days in the fridge in water. Should they be rested in water or milk? As I wrote: they should rest in water. It produces a cleaner flavor in your kombucha. I have been using non-homogonised milk for my kefir for years. I have never successfully strained out the grains, so I just retain a tablespoon of the thick-jelly like kefir for the next batch. Recently a acquired a new bunch of grains, as the old ones had gone a bit sour after the years… they were nicely compact and in a little ball. The next morning I went to strain them, and it had started breaking up into smaller grains. Is this common for non-homogenised milk? You don’t! You buy or otherwise acquire them. Put into a search engine ‘doms kefir site’ and all of your Kefir questions can be answered there.